I'm always looking for ways to prepare vegetables that will appeal to kids. My older son likes most vegetables in most forms; I don't worry about him. My younger son, also known as Hot Dog Boy, is harder to please. He likes artichoke soup and zucchini fritters, and he chowed down on the spinach pancakes I made a few months back. You know my theory of feeding vegetables to kids: Mix veggies with cheese and fry them in olive oil, and you raise your odds of success significantly. I thought these spinach balls might make it onto the "yes please" list. They're not fried, but the mixture has both cheese and melted butter, and they're finger food - who says no to finger food vegetables? Alas, Hot Dog Boy declined. Maybe it was all the other delicious stuff on the counter that day. Or, wait, maybe it was the fact that the grownups didn't leave any for the kids. Oops. There are lots of recipes online similar to this one. 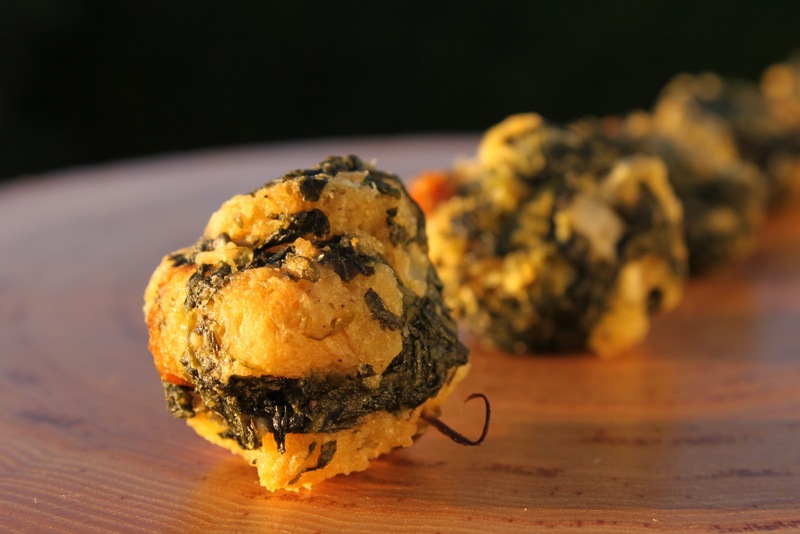 I first saw spinach balls in New York Cookbook: From Pelham Bay to Park Avenue, Firehouses to Four-Star Restaurants by Molly O'Neill. My dear friend Judith gave me that book when I moved from New York to southern California - so I could always have a little taste of home, she said. Of course, when I wanted to make the spinach balls for Thanksgiving, I couldn't put my hands on the book. This recipe is close, though. Spinach balls make a great holiday side dish (we had them at Thanksgiving) or cocktail nibble. You can shape them ahead, freeze them, and bake them straight from the freezer, adding 10 minutes or so onto the total baking time. Mix all ingredients together. Chill 15 minutes, or until the mixture is firm enough to shape. Roll into 2-inch balls, using 1 heaping tablespoon per ball. Place the balls on a parchment-lined baking sheet. Bake about 20 minutes, or until the balls are lightly browned. Serve hot or at room temperature. Lordy those look like my kinda appetizers. These sound delicious! I can see what the adults would eat these all up. I know that Ryan and I would have a hard time saving any for guests! Thanks for sharing, my sweet friend! Have a great Tuesday.